This B&K Precision triple-output programmable linear DC power supply unit provides a constant source of DC voltage for powering and testing electronic devices. The power supply unit (PSU) has two outputs that each provide adjustable DC voltage and current. A third output supplies fixed DC voltage up to 5V and current up to 3 amp, for applications such as supplying power to logic circuits. The PSU has separate knobs on the front panel for independently adjusting the output voltage and current of the variable outputs. The unit's four LED screens show voltage and current readings for the variable outputs simultaneously and are readable in low light. The variable outputs can be connected in series to supply more voltage, or they can be connected in parallel to supply more current. Multiple PSUs can be connected in series and parallel, as well. A power cord with a three-prong plug is included for connecting the PSU to a grounded outlet, and two pairs of test leads are included for testing applications. A built-in cooling fan helps prevent overheating, and a fuse turns off the unit in case of overload, helping to prevent damage to the PSU and the device under test. 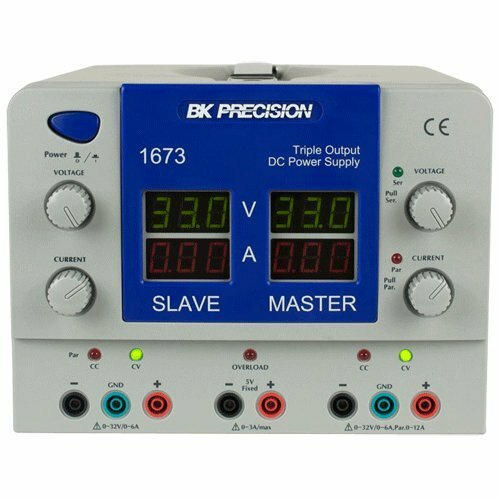 This B&K Precision power supply unit is offered with a choice of rating voltage and current for the variable outputs, accuracy, line and load regulation, ripple and noise characteristics, and weight. If you have any questions about this product by B&K Precision, contact us by completing and submitting the form below. If you are looking for a specif part number, please include it with your message.